For those of us well versed in “As Seen on TV” ads, a Chia Pet is a clay pot figure which when spread with a seed mixture and watered sprouts small green leaves. Whether a sheep, emoji or human head, the growth is intended to look like its coat or hair, such as wool on a sheep. But, in the days of my youth when my eyes first coveted a Chia, I certainly did not think of eating the greens or the seeds. What are these tiny superfoods? How much nutrition is packed in them? And, how do they compliment smoothies? As always, yours truly was excited to research and come up with the full story of what’s chia, is it really good for us and how to include it in smoothies. Tiny black seeds taken from the Salvia Hispanica plant, chia seeds proved important to the Aztecs and Mayans. These ancient cultures believed this tiny grain sustained energy. Both the seed and the sprouts of the chia plant offer nutritional benefits. While we will cover the benefits of the seeds; in brief, the sprouts can be used in salads, on sandwiches or straight from plant to mouth. ​Native to South America (not the Chia Pet manufacturers), modern times bring the chia seed back to the dietary forefront as a superfood. In other words, chia is once again gaining ground as a nutrient-rich food. In fact, “chia” in Mayan culture meant “strength”. And, with its reported health and wellness benefits, it seems this label and this seed’s place among the other superfoods may hold true. But, my question is: Do chia seeds live up to their name and reputation? Let’s start with the facts. After all, we need to know what we are getting when we add chia seeds to our smoothies, right? Note: Percentages vary based on the environmental conditions during plant growth and plant maturity when the seeds are harvested. Seven to nine percent of our daily needs in calcium, iron and magnesium. All of this nutrition in that tiny seed? Actually, chia tops the list of best plant sources for essential fatty acids, protein and fiber. So, what rewards does this reap in terms of our health? Much research regarding the health benefits of chia seeds comes from animal studies or human trials with relatively small numbers of participants. However, the emerging data is revealing some promising support for the role of the essential fatty acids and other nutrients found in this tiny package. 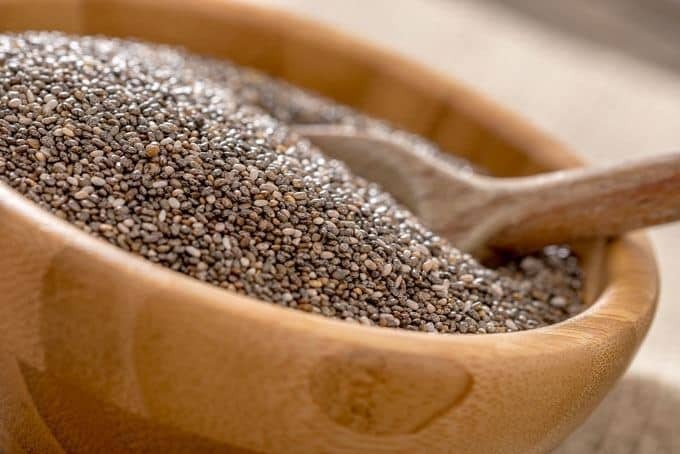 While the data appears plentiful for the value of omega-3 fatty acids in general, what are studies finding specifically in relation to chia seed nutritional benefits? Let’s take a look. Increased good cholesterol (HDL) while reducing bad cholesterol (LDL) and triglycerides. Protective of women’s heart health in particular. Achieving good glycemic control proves key to greater health and reduced complications for diabetics. According to preliminary studies, chia seeds show positive impact in reducing the risk of diabetes. Also, research finds that chia converts glucose to slow-release carbs aiding diabetic care. This fact means improved blood sugar stability as well as an increased sense of fullness for greater portion control. The high levels of omega-3s and fiber present in chia seeds lead many to believe they benefit weight loss efforts. While some studies say no, others indicate a possible relationship between the two including appetite suppression. Furthermore, one study indicates that the milled chia as opposed to the whole seed offers hope for weight control. Raised blood levels of omega 3s occurred after just ten weeks of consuming the milled version. In general, this source of insoluble fiber offers a sense of fullness and digestive regularity. In theory, these outcomes should aid in weight loss. As a plant-based source of protein, fiber and essential fatty acids, chia seeds offer a power-packed additive to vegetarian diets. In fact, the impact of such foods yields healthier results than those derived from animal-based fats and oils. Research indicates that while vegetarians generally consume enough omegas through land sources, their intake through marine sources proves low or absent resulting in potential health risks. Sufficient consumption of foods such as chia seeds offers a counterpart to this deficiency. Several eating plans require gluten-free choices. Those afflicted with gluten sensitivities, allergies or Celiac disease feel better when gluten is eliminated from their food choices. Chia seeds contain no gluten and answer the call of those needing to get creative with what they eat. Research suggests chia added to rice flour thickens the substance for a pasta alternative, and the Celiac Disease Foundation recommends chia as a naturally gluten-free grain option. I could not find any studies directly addressing the use of chia seeds during pregnancy. However, the overall impression seems to be that the benefits in this potent package boost mother and baby health. With the ease of adding chia to one’s diet, mom and baby benefit from an energy boost, replenishment of nutrients lost during pregnancy and blood sugar stabilization. Plus, the high levels of omegas are needed in a baby’s brain development. However, you should check with your doctor before consuming chia seeds during pregnancy. The research is sparse to say the least and seeking a reputable medical opinion proves wise. When changing our eating habits and supplementing with new foods, the side effects prove vital to consider. Even with the label of natural, the impact of an ingredient on our bodies can be adverse if we are not careful. In general, the side effects of adding chia seeds to your smoothies are easy to avoid. However, knowledge is the first step to a positive experience with this superfood. 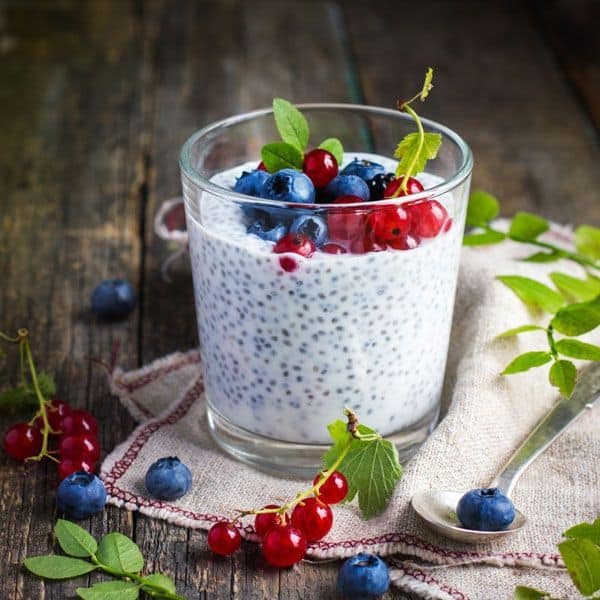 Low Blood Pressure: While the positive effect of consuming chia seeds is lowered blood pressure, this result may be problematic for those with already low readings. Low Blood Sugar: Again, the benefit of lower blood sugar becomes potentially dangerous for people with hypoglycemic issues. Digestive Disruptions: Adding too much fiber to your diet at once leads to gas, bloating and constipation. Dehydration: Chia seeds absorb water. Therefore, consuming dry seeds can dehydrate you if not accompanied by plenty of H2O. Allergic Reactions: As with all foods, allergies to the components of chia (particularly the proteins in this case) are possible including skin rash, breathing difficulties, diarrhea and watery eyes. Check with your healthcare provider before adding chia to your nutrition plan. Begin small (perhaps one tablespoon per day) and gradually increase the amount. Soak the chia seeds before using them to eliminate hydration problems. Scientists maintain the theory that the future of chia seeds holds promise, but agree more research is needed. For instance, lifestyle and genetics need to be factored into studies to discover the full benefit of this ancient food. Buy whole seeds for better nutrition and longer shelf-life. If you prefer ground chia, grind the seeds at home as needed. Choose organic or chemical-free, 100 percent pure products. Look for certified seeds for the best quality. Find suppliers in countries with high food safety and quality standards. To avoid the hassle of buying chia seeds altogether, grow them in your home. In fact, it turns out that you can not only grow them on a Chia pet but on a baby blanket, burlap bag, cheesecloth or any material which retains moisture. Sound like fun? Give this gardening adventure a try and let me know in the comments below any tips and tricks you have for those of us lacking green thumbs. Buying in bulk saves money. And, the long shelf-life and proper storage of this whole grain ensures no waste. Chia seeds and gel can be stored in the pantry, refrigerator or freezer. However, a well sealed container of chia lasts significantly past its “best used by” date when kept in the fridge or freezer. Dry seeds last in the pantry over two years and four plus years in the fridge or freezer. And, the soaked seeds or gel stays fresh two hours on the counter or two to three weeks in the cool of the Frigidaire. How would you know if your Chia seeds are spoiled? A bitter taste in place of the usually nutty, even bland, flavor of chia seeds or a rancid smell (typically chia smells mild) indicates spoilage. 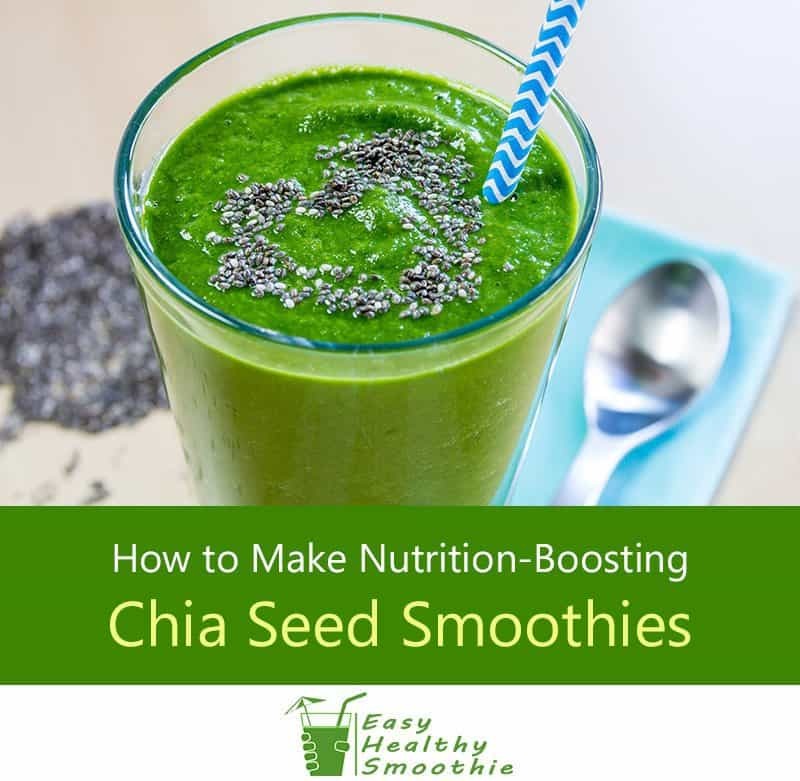 For the kitchen-challenged among us or just the busy, including chia seeds in your smoothies proves easy. While you can sprinkle them in dry, users and experts tend to recommend soaking them first. Making a chia gel (soaked chia seeds) proves quick and simple. Just add water to the seeds and let them sit for ten minutes or longer. In fact, they can set as long as two to three weeks in the refrigerator. Pre-soaking these seeds maximizes the benefits of this superfood. Easier to digest, less dehydration and better nutrient absorption result from the few extra minutes required to do so. 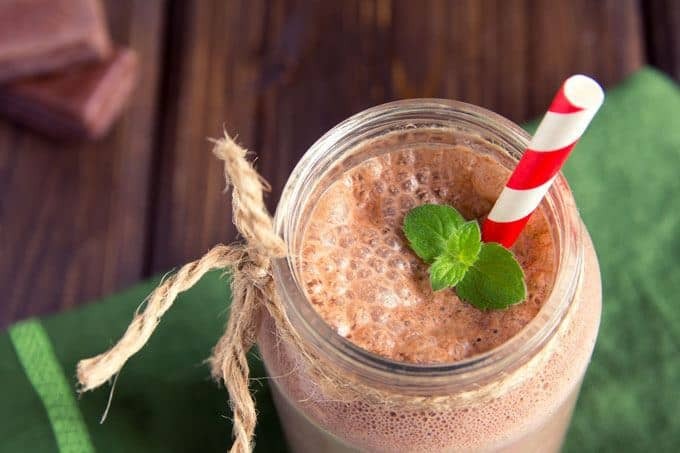 While you can add chia seeds to nearly any smoothie recipe due to their mild taste and smell, check out these tasty combinations to get you started. 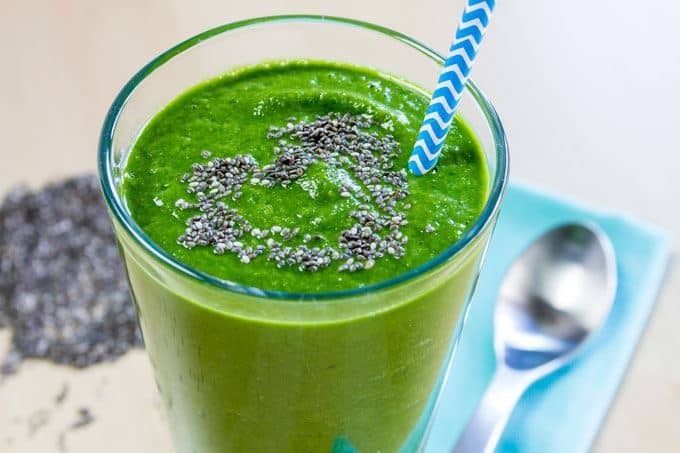 Combining the nutrient punch of chia with the benefits of leafy green spinach offers you a superfood combination to guard against heart disease, diabetes and more. Add all ingredients to the blender starting with the milk and yogurt. Blend until smooth. Do you love chocolate but find it difficult to incorporate it well into your nutritious eating plan? Toss ingredients into a blender and combine on high speed until your preferred consistency is reached. Tip: Chia gel is a quick, pre-soaked alternative to dry chia seeds. You can make your own ahead of time with chia seeds and water. 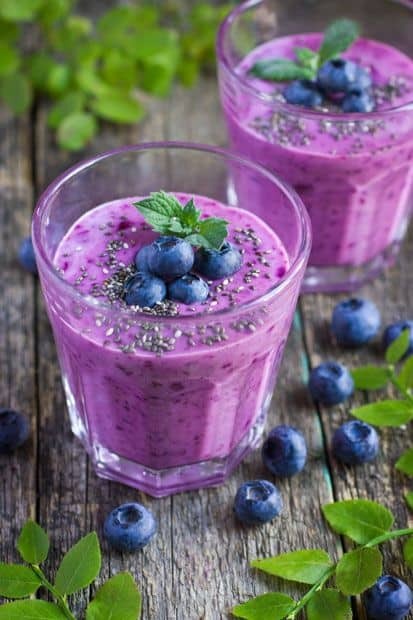 This smoothie is quick to whip up with frozen or fresh blueberries and a scoop of a few other ingredients. No cutting, dicing or peeling proves a quick, healthy and delicious option for those on-the-go. Combine all ingredients except the honey in the blender on high speed until smooth. Before enjoying, add the honey according to your taste. Tip: Soaking chia seeds in the liquid portion of a smoothie (i.e. milk or water) for at least 10 minutes before blending maximizes their benefits. In particular, they are easier to digest and the nutrients are better absorbed into your system. Are you ready to add chia to your next smoothie? After researching chia and getting used to adding it to my smoothie, I’m looking at the Chia Pet in a whole new way! Natural and easy to use with few side effects and plenty of health benefits, chia seeds seem a no-brainer compliment to a healthy eating plan. With their mild taste and no strong smell, I can incorporate them with a smile not a gag reflex into my smoothies and more. 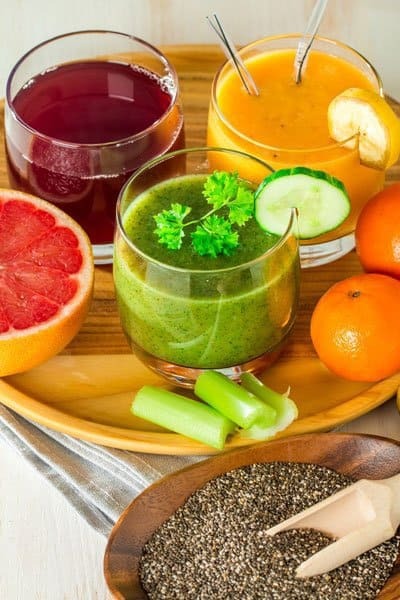 Make delicious and healthy Chia seed smoothies and get the full story on their health benefits, side effects, where to buy and how to store them.